Only 2 weeks left in the regular season. District games wrap up this week. Plenty of important games to decide playoff seeding. District games wrap up this week and pretty much all are decided with the exception of 9-9A and 7-3A. Expect competitive games as teams are looking to finish strong these next two weeks. #1 Oxbridge Academy - Oxbridge remained undefeated and will have the top seed in the district playoff when things tip off in two weeks with an eye on making it the state Final Four. 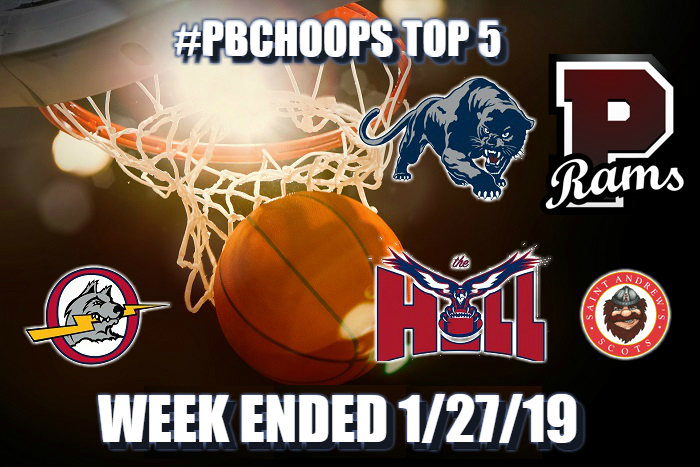 #2 Forest Hill - Falcons big win over Royal Palm Friday night clinched the regular season district title but they still have a few tough test left including a tilt with Lake Worth Tuesday and Dwyer Friday. #3 St Andrew's - St Andrew's stays solid in the #3 spot, locking up the top seed in district 12-5A as the only undefeated team. Big test Tuesday as they face fellow class 5A program Pine Crest in Broward County. #4 Dwyer - Panthers are on a roll and have won eight straight, the last four by double digits. All that will be tested this week as they face district rivals Royal Palm Beach and Forest Hill. #5 Palm Beach Lakes - After a stumble last week, the Rams got back on track with three impressive victories. They stay busy to close out the season with six games these last two weeks. This game has huge district implications with both teams 5-1 at the top of the standings. Wellington won the first game in OT. Expect more of the same. Royal Palm took the first game but Dwyer is a different team now. Look for another classic matchup. This is their first time facing each other this season and couldn't come at a better time. Both teams are playing at a high level and are looking to keep that momentum going heading into the post season. Central pulled off the victory in round one of this cross town rivalry in a close game. Both teams need this game for district seeding.